By John C. Toman. Posted March 18, 2012, 10:14 AM. A very cold weekend storm blew in Saturday, the strongest and last of the winter season, bringing heavy rain, some hail overnight, and snow above the 2,000 foot level in Southern California\'s inland valleys. 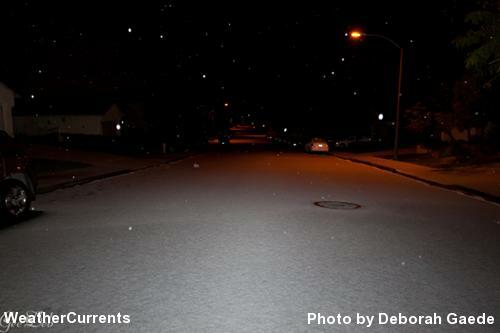 Snow fell in Beaumont, in the San Gorgonio pass, overnight. Accumulations were several inches, and snow showers will continue today, with a freezing night tonight there. 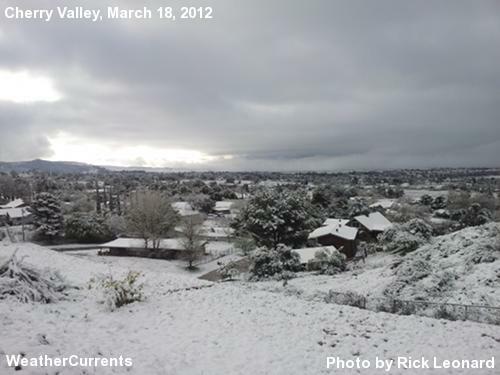 Snow was also reported on the Ortega Highway above Lake Elsinore, and in the San Jacinto foothills above Hemet. 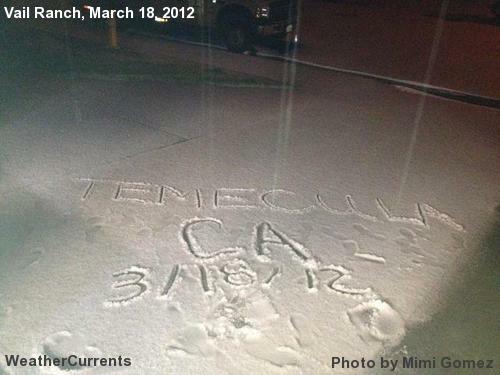 Elsewhere, a hailstorm was reported in South Temecula between 12:30am and 1:00am Sunday morning. Hail and graupel fell, but snow was absent from the mix. Snow was still a possibility, especially in Southwest Riverside County, through the morning hours, especially if thunderstorms materialize. Showers are expected to be widespread through the morning in Riverside, San Bernardino, and San Diego counties, tapering off through tonight in the north and tomorrow morning in the south. To the west, only isolated showers are predicted this afternoon in Simi Valley, which had received no rainfall since midnight. Rainfall totals were heavy so far through 10am Sunday morning: 1.71" in Beaumont (Cherry Valley), 1.48" in De Luz, 1.28" in Temecula, 1.25" in Lake Elsinore, 1.21" in Fallbrook, 1.18" in San Bernardino, 1.15" in Murrieta and 1.03" in . Totals were below an inch in Simi Valley (0.97"), Jurupa Valley (0.93"), Moreno Valley (0.91"), Hemet (0.81"), Riverside (0.76"), Menifee (0.68"), and Perris (0.56"). 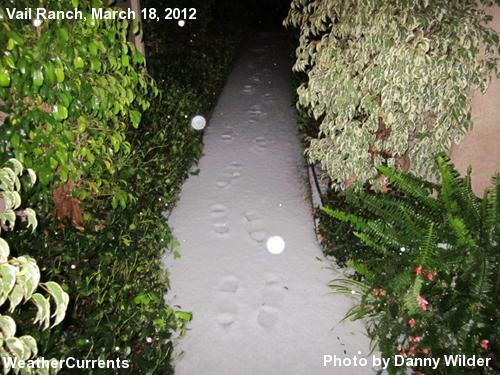 In San Diego\'s City Heights, near the coast, 0.83" of rainfall was reported. Other results were in East San Jacinto (0.52", courtesy of Monty Parrott), and in South Fallbrook (0.91", courtesy of R.C. Blankenhorn).